It was a busy week..
My sister and her dh from TX came to for a visit ..I hadn't seen her in over a year, so we had lots of talking to do! It was wonderful to see her, and the 3 surviving sisters got to spend some time on Sunday. We hope next June we will all be able to get together for a family reunion. Time flies! Since it was the last day of summer, warm and beautiful, I went with an apple theme. I served buffet style from the kitchen island for the party.. 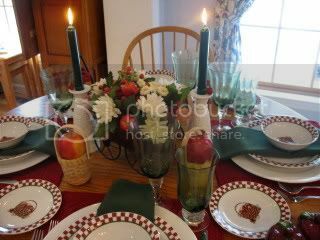 But I did a tablescape before I put the dishes back till next year..
Green stems and waters from Lenox..
Nantucket baskets with a small apple at each place.. The white embossed candlesticks are from Villeroy and Boch, basement clearance..
And since it was a Birthday Party..we needed some candy corn in a Candy Corn bowl. 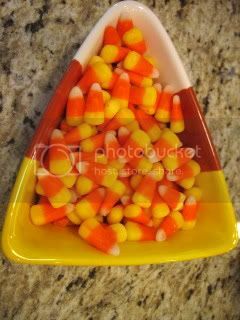 Set of 3 Candy corn bowls from Christmas Tree Shops..I love that store! 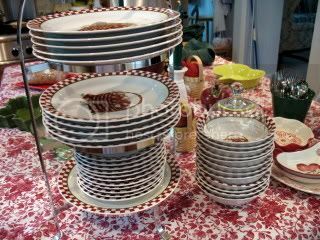 The dishes I got a few years ago at Christmas Tree Shops..15 dollars for service for 12...I use them once a year...The Nantucket baskets are from there too, there is a glass insert for a candle or for flowers..got them half price for a dollar a few weeks ago..The apple platter and side dishes are by Pfaltzgraff. I'll show some of that tomorrow for Foodie Friday.. 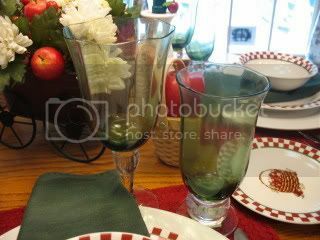 Please join Susan at Between Naps on the Porch for more tablescapes..
Goodness Kathleen...I don't know where to begin. First off, your table is just so lovely. What a warm and inviting setting. 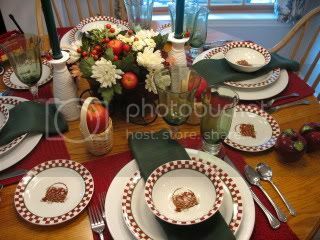 Those apple dishes are perfect..they remind me of the ones from CTS w/the farm animals. 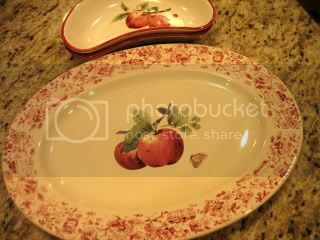 I'm also eyeing the apple plate with the pretty toile like border, as well as your Lenox glasses..beautiful color. I'm sure your Gson loved that yummy Cake...I know I would. Not to mention the rest of your family, with that Magnificant Menu. Any leftovers? Hope you're catching up on some well deserved R&R. You certainly earned it. I think 1 of my fav things about blogspots is the creative ways we make even our dishes shine again. Okay I tired now. How on earth did you make all that food. Any time you want to throw a party for my birthday, coming up in October by the way, I'm all in. Wow. The table looked so pretty too. Happy Bday to the wee one:) So cute!! 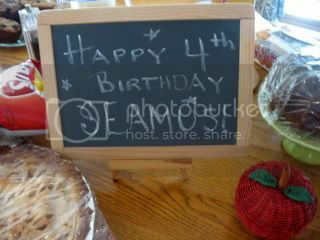 Ahhhh, Nana went all out for Seamus's 4th birthday. How wonderful that your sister was there for his birthday. Great menu, Kathleen, and lovely tablescape. I love the mini wagon, the Nantucket baskets, and the candy corn. 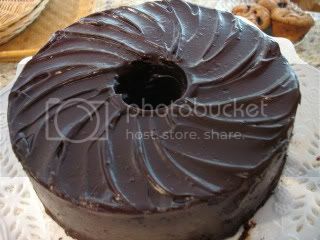 The dishes are all wonderful and the cake looks delicious. Well done! Whimsical and pretty! Hi Kathleen! Oh, your table is so sweet! I'm so glad you had the chance to really share it with your family! Your food sounds so good and that cake is making my tiny house water. Apples just say September to me! Wow! What a menu for a 4th Birthday! This all looks and sounds great! Any leftovers? I'll be right over! What a wonderful theme and your food sounds delish! Happy Birthday Seamus! Kathleen, I love those apple dishes. You must have had a cooking marathon, woman! Happy 4th birthday to that cutie, Seamus. What a bright & happy looking table! Just delightful the way you carried the theme down to the smallest detail. I love your apple theme, and your meal sounds delicious (oops, pardon the pun!). Happy Birthday to your DGS! Wonderful table! Well put together! My sister and I live far apart too and once a year is not enough!! Cute, cute, cute table. So very cheery! Such a beautiful table..love the centerpiece..and the menu...Oh, my goodness. You must have cooked the whole time they were there..no..bet you cooked some beforehand and used your freezer? The desserts sound luscious and I know your little fella loved all the treats you had around for him. Cute, cute, cute! That's my kind of party! Hope you'll stop by to see my angels! I just went over to Barbara Jacksier from your blog and nearly fell out of my chair at her header. Wonder if that is her living room? It is so so pretty..threw me into a covet state..!! I really like the apple theme! Cute ideas for the birthday party too! The menu is incredible! Yum! It was such fun to page through your post. I'm drawn by the cheerful table that you set. Those colors would make a sad-sack smile. Then there is your menu which really made me hungry. This was a wonderful party and it's a wonderful post. I hope you are having a great day. Kathleen, I always enjoy your apple table. Wow, I hope you had help with the cooking... that's a lot of food! It all looks great. Happy 4th to S.
You did such an impressive work for Seamus! Great job! Fantastic table, Kathleen! I am sure your grandson's birthday party was a bit hit! Everything looks lovely, and the menu sounds delicious! The cake looks yummy, too. Kathleen, thanks for stopping by, so glad you did & I would love for you to join my Fall party. What a beautiful table you have set! And I would love to go to NE one of these days. Hope I get there! 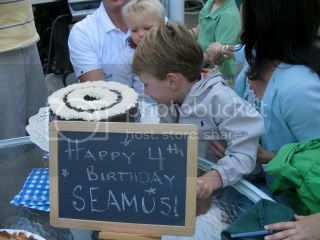 What an adorable birthday party you put together for Seamus! It was perfect for kids and adults. Lovely settings. Ooh! 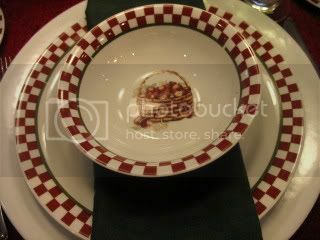 I want those dishes with the red and white squares on the edges! So cute! I love red and white in the kitchen. Happy Birthday to the little guy! VERY cute! Food sounds FABULOUS!!! What a charming presentation with so many thoughtful details! Your menu sounds absolutely magnificent! I would love to have been seated at your table, but I fear that I would have needed to be hauled away (in a much larger version of that cute li'l red wagon!)!!! What a feast! Love the tablescape! Happy Birthday to Seamus! Did you invite Matt Lauer to the party? Oh my gosh, what a feast! What a wonderful gathering it must have been, Kathleen, and to have all the surviving sister there must have been special indeed. Happy Birthday, Dear Seamus! Happy Birthday To You! Well tell him Happy Birthday! How fun! I am THRILLED you are going to join us for Doors of Welcome! Welcome! We should have a great time! It is so much fun when the family can get together! You had quite a menu! Happy B'Day to the Birthday Boy! Goodness honey child, there must have been one exhausted cook, or more like a team of them. It looked fun and delicious and I bet it's a birthday he will long remember. How special! All of those apples are so much fun! And now I feel like the one whose playing "Where's Waldo?" I was on that shopping trip when the white candle stick holders were purchased!!! And I think those Nantucket basket look familiar.Not to mention the candy corn candy dish! We do have fun. 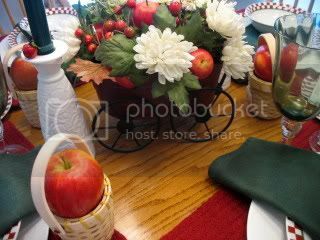 What a pretty table setting with the apple dishes! 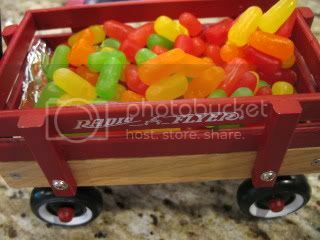 I like how you incorporated the little red wagon and the candy corn- it is a young one's party, after all! I'm sure Seamus had a blast. Love how his name is spelled, too.~ More traditional. Enjoyed seeing it all. I love your table and your menu sounds delicious! I adore your tablescape. I wanted to get some apple motif china for this autumn, but now I will have to wait! Love the foods you served. Kathleen, I thought I had commented on here but guess not. Your apple themed bday table is terrific! I think those dishes are perfect for September and for your little grandson - what a cutie! My son (21)loves the name "Seamus" and says if he ever had a son, he would love to call him that - even though we have only a tiny bit of Irish blood in us! Kathleen..how are you still standing??????? You should still be laid on recovering from that menu. Its not a wonder your place is the gathering spot :-) Your table and buffet both look gorgeous. Love the Mike and Ikes :-) I know Seamus will grow up remembering how special you made his birthday. Wow, Kathleen--what a wonderful celebration! Love the menu--hearty and something for evryone. Your gson's name is super--we have all Gaelic names in this house! Some many lovely things going on here--I am always so happy to see your header which you change frequently, you set the most welcoming table! I hope you are enjoying these first warm days of fall! You really outdid yourself - from the tablescape to the birthday party!! There wasn't one thing I wouldn't have tried... may not have been able to walk for a week but would have moved everything! 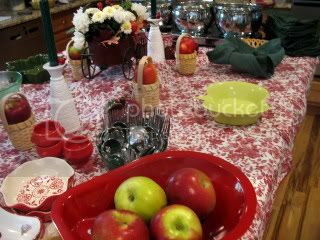 Always enjoy your apple tablescape! 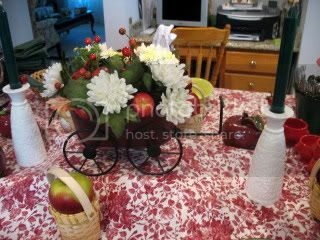 Love the red tablecloth!